If the thought of speaking in front of a large group of people makes you want to call in sick, you’re not alone. Far from it, in fact. Many people play it small to stay safe – maintaining their current position because they feel secure and supported within it, and fear the failure and conflict that may result from moving forward. But to grow as individuals and continually increase our contribution, we have to break from our comfort zones. And a lot of that process is derived from our ability to communicate effectively, often to large groups of people. Whole Person Coaching is one of the most effectual tools to holistically reinvent your story, eliminating the stress and panic that are often grounded in little more than our fear of the worst case scenario. With that in mind, I’d like you to meet Jackie. Despite a notable level of success in her personal work group, her struggle with public speaking was having a damaging impact on a number of different areas of her personal and professional life. In the pages to follow, I’ll walk you through her mindset and detail the process we used to catapult her from stuck to success – including the breakthrough conversation that drove her to an unexpected result! You can have it all. You just need a different point of view. I had a coaching client last spring we’ll call “Jackie” (for confidentiality purposes). Jackie hired me to help develop her public-speaking ability. Driven to panic attacks and even tears with the threat of public speaking, she’d endured years of stressful presentations that were unrepresentative of her abilities due to her overwhelming insecurity and nervousness. Similarly, she’d remained stuck in the same position due to a fear of failure and conflict, despite numerous offers for advancement that included greater responsibility, more visibility and influence, and a higher salary. It’s important to understand that, despite her phobia, Jackie was highly productive within her own little niche. In fact, as team leader, she led her group to become one of the highest performing departments in the company – a level of mastery and success she attributed to operating within her “comfort zone” and with the same small group of familiar people, day after day. Realizing she had found a safe place in the company, Jackie chose to be the best leader possible to her small but successful team unit. Unfortunately, we don’t grow within our comfort zones. If we could, we’d all be millionaires by 25 without ever having changed out of our pajamas! I don’t know about you, but I had to get dressed today. Jackie was playing it small to stay safe. But due to her work ethic and level of expertise, something else was happening she didn’t intend. Jackie’s team and it’s communicative, effective performance had gained the attention of her company’s senior leaders. In fact, her group became the standard for team effectiveness within the entire company. Due to a desire to be safe, liked and comfortable, Jackie had cultivated a departmental culture that allowed her direct-reports to feel the same – an environment that was conduce to productivity, though not individual advancement. Despite her success, Jackie was at a crossroads. She was unsure whether she wanted to remain in her comfort zone indefinitely or break through to a new and more challenging level within the company. Realizing she needed some help, Jackie sought me out after hearing about our work through other departmental leaders and management-level peers in her office. In particular, she was drawn by the performance-driven, self-actuated success that others had received through Whole Person Coaching. And Jackie really didn’t have a moment to lose. She’d been asked by the president of the company to share her team’s secret to success at an awards dinner… in front of the entire company… in six weeks. Is it possible to overcome a debilitating level of fear and aversion someone has spent their lifetime building in less than two short months? Yes, it is. Jackie’s initial goal was to write a thought-provoking, educational speech that would bring laughter and learning to the room. Her secondary goal – as she referred to her little “secret” – was to get coaching on her nervousness when speaking in front of her company. “I was terrified by the idea of speaking to a room filled with senior management, and even my peers,” she told me. But here’s the thing: Jackie was smart, savvy and knew exactly what she wanted. She just had to know where to look, and how to interpret what she saw there. During our initial meetings, Jackie shared her struggles. Typical of most of us who’ve created a false story around the experience of public speaking, her imagined experience was the worst case scenario. To be fair, public speaking is the #2 most common fear, second only to our fear of heights. And in some polls, public speaking (a.k.a. “public sweating”) firmly holds the top spot. Jackie was deeply concerned with how well she’d do, how others might perceive her, and what impact it might have on her future at the company. Occasionally, I’d hear a softer voice of reason, one that offered the insight that all of her ideas might not actually be true. But her primary story was filled with fear and conflicting thoughts – a recipe for unrelenting stress and sleepless nights that nearly drove her crazy. Unfortunately, this was the story that was loud and clear, blocking her from writing and performing her speech. With less than two months to prepare, we had a lot of work to do and a short time to do it in. But we also had five business trips before her big day, five opportunities to practice and work up to the main event. Can Whole Person Coaching alleviate emotional strain and tension simply by giving you the tools and insight to rewrite your personal story? Yes, it can. Because of its universal nature, Whole Person Coaching is applicable to any aspect of an individual’s life – personal or professional. Better yet, the resulting learning and development that occurs from the change-making process in one area of an individual’s life can be applied to other areas as well, transforming your entire life, one story at a time. In fact, it’s not uncommon to witness a client creating changes in smaller areas of their life to build the confidence and competence required to tackle the larger and seemingly more difficult ones. Jackie’s game-changing conversation happened on our fifth session. I asked her to step into that final day, the big presentation, and create the most powerful story imaginable about giving her funny, educational speech for her company’s awards dinner. Her tale began as she painted a bleak and treacherous outcome, creating an emotional backdrop that triggered her into a deep sweat (literally). I could immediately hear the tension in her voice and see it overtake her body as she fell into a worst-case future that had not yet been created. “I can tell you believe it isn’t fun,” I said. “But what if it was? Play with me a bit by imagining yourself on stage. You’re speaking in public. And you’re having fun.” I waited patiently for her response. “You mean the top team in the company?” I jested. “Yes! We are a top team because of the fun we have together and the collaborative approach that’s reflected in our motto: ‘We are all on top. So who’s on first?’”. “Do you think this’ll fly? After all, the president of the company wanted me to speak…” And the look of fear began to reappear across her face. “Great! I can see you already there…” I gestured to a crowd enthusiastically applauding and smiled with anticipation. “That must feel good. Anything else for today?” I asked. “Nope coach. I feel complete.” And she grabs her stuff and jets out the door with a skip in her walk. 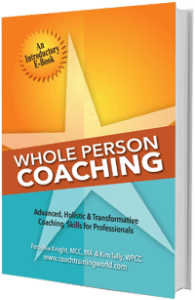 Does Whole Person Coaching deliver quantifiable benefits that continuously build an individual in their personal and professional life? Yes, it does. Within the skit, each member had a limelight moment. And then it was Jackie’s turn. Without missing a beat, several of the team members revealed a turntable and musical instruments, accompanying her as she performed a cover of “Walk This Way” (the Run D.M.C. version!) to the uproarious delight of the entire room. [Or “Good Vibrations” by the Beach Boys or “Eye of the Tiger” by Survivor] Jackie and her team received standing applause from the whole company. The following Monday morning, the company president invited Jackie to his office to discuss the evening. And by discuss, I mean pick her brain. Jackie was promptly given a new position in the company within which she was responsible for developing other teams, both locally and internationally! Further, the company president understood and admired her desire to continue working on her fear of public speaking. He had no doubt it would enable her to lead the company into even better customer service. As a result, he offered a small stipend to further her additional training! Jackie returned to coaching for her final debrief session. And it was during this session I learned that another one of her secret wishes was granted that very same week. To celebrate her promotion, she gathered a few friends and visited her favorite local karaoke bar. That night, as she walked off stage, she was met eye-to-eye with a man who had been curious about the charming, confident girl he saw on stage. They began a slow, but promising romance. Working through her fear of public speaking gave Jackie the additional confidence to reinvent her story in other aspects of her life – in this case: romance. When Jackie first came to coaching, the depth of her fears had consumed her and dramatically impacted not only this aspect of her life but the rest of it as well. As a result, she was paralyzed by her fears and wasn’t poised to take the action needed for success. Through the Whole Person Coaching process, we identified that, even though she was nervous speaking in front of an audience, Jackie had confidence in abundance while on stage performing karaoke. By leveraging her experience singing, she found within herself the courage to speak. And by drawing upon the story of who she was in each situation, she was able to quickly rewrite the story of herself as a speaker by envisioning the best possible outcome – one that was an accurate reflection of her abilities and talents. The power of our story can make or break our success. The story Jackie had written about her ability to speak publicly was filled with limiting beliefs. But they were all based in her imagination. Her karaoke story was based on the reality of her experience. Admittedly, she was fearful to jump on stage and sing in the beginning. But at the same time, she realized there wasn’t much to lose if she made a mistake. Within the workplace, Jackie had placed a high cost on potential errors, without even making any, and quickly began riding the white waters of fear – all this without any evidence that anything bad would even happen! How many times have you gone into a new experience and wrote the ending in your imagination before you’ve stepped a single foot into the experience? Was the ending you thought of positive or otherwise? How do you feel when you think about the worst case scenario for something that hasn’t happened? What might be possible if you imagined the best? Jackie’s ability to sing her heart out was based in positivity and fun – an ability easily harnessed to transform other aspects of her life. In the same way, the power within you thrives in positivity and possibility! Don’t miss another opportunity or a single moment of life-fulfillment. Start leveraging it today!